Last Friday, community residents and prominent leaders gathered to celebrate the groundbreaking of Borinquen Bella, a $11.7 million affordable housing rehabilitation project by Latin United Community Housing Association (LUCHA). 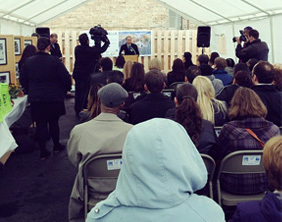 Through this project, 47 units of housing will be rehabbed and preserved as affordable. Borinquen Bella will also bring investments by creating 40 construction jobs and opportunities for local vendors. In addition to developing housing, the project will restore two historical and culturally significant murals. “Breaking the Chains” located at 1456 N. Rockwell was painted by John Pitman Weber in 1971 and is one of the oldest surviving murals in the country. “Honor Boricua”, located at 1318 N. Rockwell, was painted by Hector Duarte in 1992. The original artists will be leading the restoration of the murals and will be at the groundbreaking to answer questions.